Looking at scoring in the NHL, a great metric to measure success is “points per game”. Here, we’ll look at both actual points-per-game as well as an “adjusted” points per game metric that tries to account for high-scoring eras, and eras where there is limited scoring in the league. This chart shows actual career NHL scoring as of April, 2017. 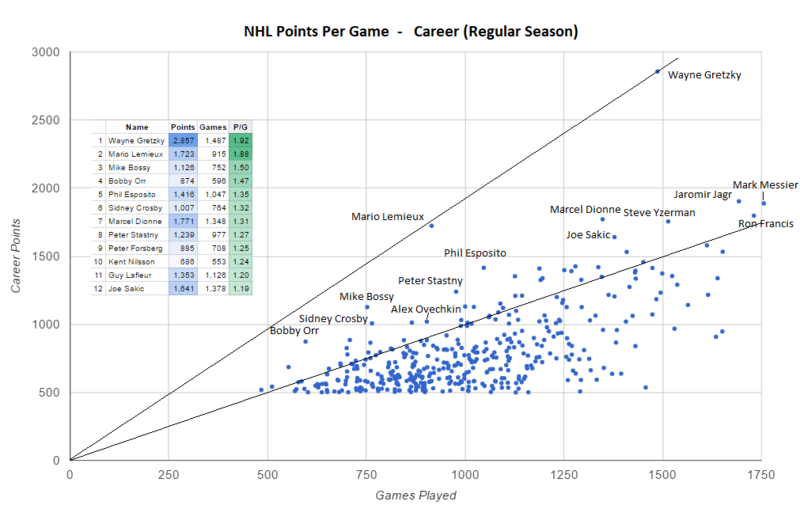 The two lines in this chart show you 1.0 point/game and Gretzky’s amazing 1.92 point/game pace. It’s a great demonstration of where current stars sit, and just how the records of Lemieux and Gretzky stand out over time. Stats are taken from the NHL Statistics Database. For a more interesting metric, using the adjusted scoring metrics from www.hockey-reference.com. 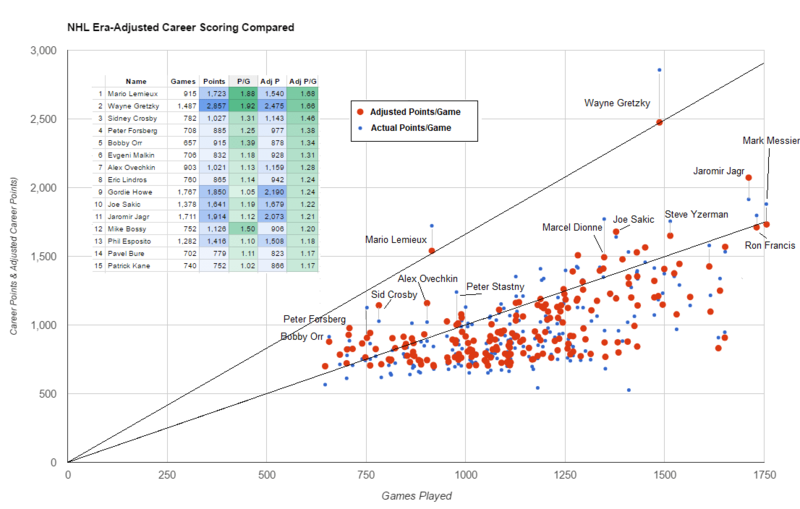 I built a visualization of adjusted goals per game, accounting for the scoring in different eras. Players like Gretzky who played in a high scoring era saw a significant drop on the charts, while players like Peter Forsberg and Sidney Crosby saw a significant increase from playing in a low-scoring era. I’m looking for a package to visualize this data in interactive format, but so far I’ve failed. If anyone knows of anything, let me know. I came here to say that. Now the plot will allow you to hover over individual points. Also: can I use your graph on my blog? How do I find your email? I looked around a bit without success. I am filling in my email with every comment. Hi Coach Eric. I would love to send you an email. Please let me know how. FYI, my blog post is non-commercial. It is about data analysis, and your graph is a great illustration of the statement, “Don’t throw away outliers blindly” (they might be Wayne Gretzky).